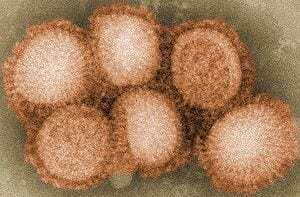 A triple reassortment strain of an H1N2 virus, with genes from avian, swine and human flu, has been shown to jump easily via air to mammals. Like that responsible for the 2009 pandemic, the new strain, known as Sw/1204, is a ‘triple-reassortant’ virus — that is, one with genes from avian, swine and human flu. Such viruses, which first appeared in North America in 1998, have been circulating in Korean pigs for at least a decade.